Omigoshhhh!!! It’s here!!! My Snugg SSC!! Love the prints!!!! She nap for two hours WITHOUT needing me to pat her. Same routine as her morning nap – grumbled and rolled over to her side and fell asleep immediately!! Two and a half hours! I can now start to leave the room while she nap. I am oh-so proud of my little girl! Hurray! I put Maddy down sleepy and thought I might try to pat her to sleep. She grumbled for a few seconds then rolled onto her side and nap for almost two hours! Uninterrupted!!!! She fussed a little bit more..perhaps a few minutes but no crying, just unhappy grumbling. I coaxed her onto her side and voila! She fell asleep almost immediately. She seems to be in a deeper sleep too, less startling and less jerking about. I am really happy with this progress. I would like to clarify that these days of training are actually to try help Maddy to be able to continue to sleep after being put down for her daytime naps. So perhaps the title ‘sleep training’ is a tad misleading. Maddy rolled around fussing mildly on her mattress and eventually fell asleep after 10minutes. She nap for about an hour. Yippee! Maddy took a bit of time to fall asleep after being put down but fussed not more than 5 minutes. She didn’t cry much either, more of grumbling. She eventually fell asleep on her side and slept for 2 hours. She woke up once or twice starting to cry but I picked her up, cuddled and laid her back down. Maddy was delightfully but unusually happy this morning! She happily played by herself without needing much interaction with me today but of course, I was just right next to her working on the computer. She showed no signs of being sleepy and I knew forcing her nap will do no good. She did have a moment that I thought she was fussing so I drew the curtains and started humming her fav sleepy lullaby. And guess what she dud? She started laughing at me! Needless to say, she didn’t nap this morning. She resisted napping again but was sleepy so I held her for a while before putting her down. She slept for about half an hour then my office rang and woke her up. Oh well…. 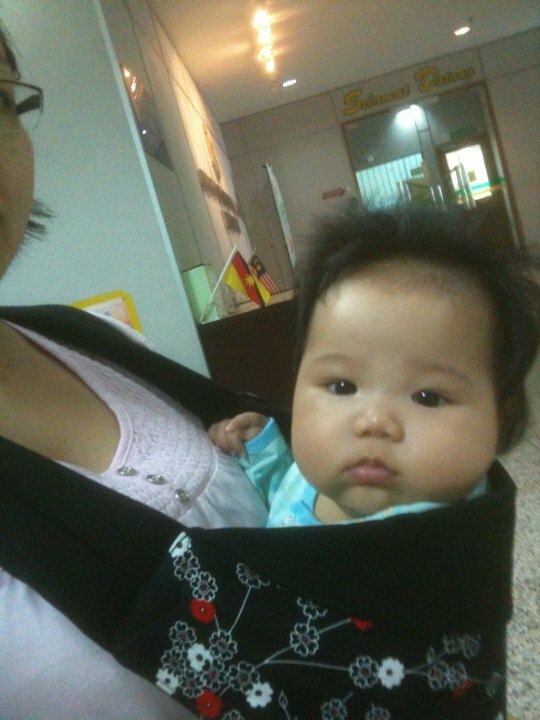 Maddy has grown out of the cradle carry of her pouch sling. I can hardly stuff her chunky legs in it anymore and I think it must be uncomfortable for her too. While there are other carrying positions that I can put her into (tummy-to-tummy, kangaroo..) she is still a little small to fit properly in those positions. Besides, her increasing weight is putting some strain on my shoulder with the pouch. So I went in search of a new carrier for her – in baby shops and of course the wonderful wide web. Where we are, baby shops here do not stock many choices and there are almost certainly overpriced. So I started to dedicate some time into researching online for it. 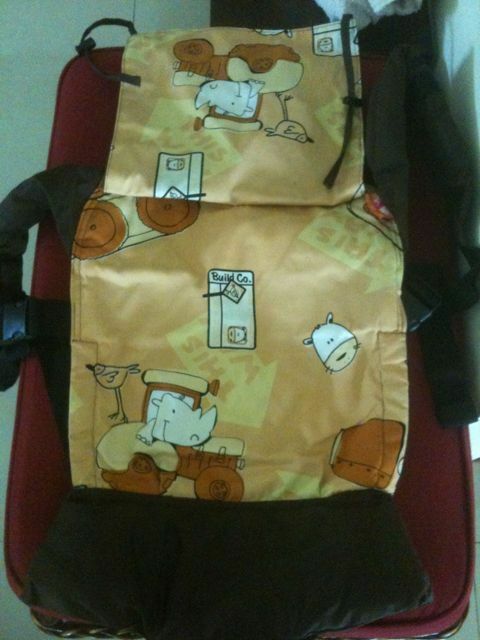 There is so much science into choosing a baby carrier it will blow the mind of the new inexperienced mother away. And then, there’s the vocabulary! I wished they had included babywearing 101 as a chapter in the pregnancy books. Maddy started out being carried in a pouch. I had purchased it out of desperation during her early weeks when she had wanted to be carried around all the time and my arms were killing me! Then we started bringing her out shopping in it and found that it was fabulous! No manouvering through crowded aisles with the stroller and having to search for a lift to bring the stroller up and down different floors..simply fabulous! So cozy in her pouch! Anyway, time for an upgrade. Traditional carriers sold at most, if not all, baby shops are probably the most popular so-called crotch carriers. 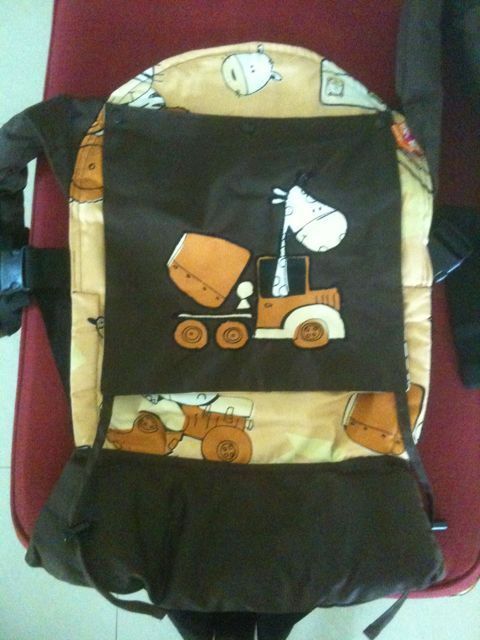 They have a hard padded body and so easy to put baby in and take them out. A very well-known brand would be the Baby Bjorn type. While I am sure Bjorn had perfected their design to be very baby-friendly, I am still reading lots of reviews on how bad it is for your baby to be dangling and supported by his/her crotch. The right way to carry a baby supposedly should be with baby’s bum supported in a natural sitting position for a healthy development of baby’s spine and hips…didn’t I mention there is so much science in this? On top of that, I didn’t really fancy the hard padded body – hot for Maddy and might be a pain to store away during travelling. But I still wanted a carrier that has some sort of a body for baby to sit in and with buckles so I can pre-adjust and just click the straps the on whenever in use. I tried a ringsling before and am totally hopeless at adjusting it (it is up for sale by the way if anyone is interested..almost brand new, never used). SSCs are fast becoming the modern mommy’s must-have ‘accessory’ and they are so functional too!! I bought my first SSC from Littlepods to try it out and never looked back since! Maddy and I were at the immigration office for four whole hours one day and she sat very quietly in the SSC while I went up and down different floors to get her passport and visa done. Now if I had brought her stroller I would’ve gone insane trying to cross the street (this isn’t a very stroller friendly place) and manage the stroller in a crowded government office. And Maddy usually won’t sit in there for more than an hour let alone FOUR!! The Littlepods SSC is great, but I need something with more support (waist support and slightly padded body panel) for shopping trips and travelling. We will still use the Littlepods for marketing, grocery shopping and afternoon strolls by the beach. So have decided on a SNUGGbaby SSC with a great cutesy print for Maddy. Have placed my order and waiting ever so impatiently for it to arrive on our doorstep! After that I put her down but she only slept for about 30 minutes before waking up again all bright and smiley. She fussed for quite a while, about 20 minutes , before finally falling asleep. Again, it was because she wanted me to stand while putting her to sleep. I did the up/down routine again which took me maybe 4-5 times before she stopped fussing. I only needed to hold her for about 5 minutes before she was fast asleep enough to be put down. She slept for about two hours with minimal patting and I didn’t need to pick her up. Improvement! The up/down routine is tiring, yes. Motherhood does require so much patience and dedication. But I find that it works well with Maddy…she just wants to be held and loved and it makes her calmer. This is Day 3…in time, Maddy will soon learn to sleep when being put down for naps..I know she will. Last night was the second night Maddy slept back in her crib after about two months of co-sleeping with us on the bed. She had a phase of waking up for more feeds at night (growth spurt maybe?) and I was so tired from the constant getting up to and fro her crib that in the end I let her sleep between us so I could nurse her lying down. She got plenty of milk (isn’t it obvious?) and I got plenty of sleep. But she loves sleeping with her arms and legs all out (picture a starfish) that hubby and I were both literally hanging off the edge of the bed to give as much room as possible. But we both secretly loved having her in between, especially in the morning when she would wake up and start picking on our clothes or arms or whatever part of us that’s within reach of her pudgy little fingers. And when we turn and look at her she wouls give us her sweet gummy Good Morning smile. Priceless moments indeed! However I suspected that whenever we toss and turn, it woke her up sometimes. So since her night feeds are down to twice a night, I thought to move her back to her crib again, which she obliged without much fuss. I had a guest in the morning so she was in my arms when she was sleepy and nap for about half an hour. I didn’t manage to put her down. After rocking her to sleep I laid her down and she managed to nap on her mattress. But she still woke up every half hour or so and I had to pick her up and calm her down before putting her back down. She nap like that for close to 2 hours. Even though I had to keep picking her up or pat her when she stirred, it is a small step towards her being able to nap better on her own in the future. I moved my work laptop next to her mattress so that I could work and watch over her at the same time.